On 13 July 2017 Sergeant Vasiliki Plexida thanked God and the Virgin Mary at the Divine Liturgy that took place at the the Monastery of Panagia Evangelistria Akrotiriani in Serifos, after the miracle she experienced on 19 April 2017, when she survived in a miraculous manner the Greek Army helicopter crash in Sarantaporo that unfortunately left four officers dead. "By the time I realized the first hit, unconsciously I did my cross and asked the Panagia (Virgin Mary) to help me. She immediately came down, I saw her fully alive, she uprooted me with the floor and the seat together, I felt being uprooted upwards and she placed me completely to the back, to the left of the helicopter turned halfway backwards so as not to remember any image." The sergeant dedicated an oil lamp to the Virgin Mary, onto which a statuette of a helicopter is attached as a testimony on behalf of the miracle. She also donated her prayer rope and the uniform she was wearing that day, which has a tear due to the crash of the helicopter. These were requested because they were touched by the Virgin Mary when she saved Vasiliki from the crash. Vasiliki's mother also explained about her daughter as soon as the helicopter began to fall : "As long as she was conscious after the fall of the helicopter, she was praying to the Panagia, and the Panagia Akrotiriani was the one who heard her and saved her." "Pontus, Thrace, the Aegean, Cyprus are one and the same places that the Panagia protects. Just as she took Vasiliki into her arms and brought her down from the helicopter. I want you to know that all the airplanes of the Greek Armed Forces, our air force and all the ships that pass from here, as well as the soldiers no matter how far they are from Pontus, Thrace, the Aegean and Cyprus, they will be thinking of you praying on behalf of our nation, with the help of the Panagia who has appeared many times." He also thanked the abbess "for the present opportunity you gave us to thank the Panagia for the miracle that took place. We also want to thank you, because you, here in the Aegean, in this eagle's nest, you protect Thermopylae." When Vasiliki was asked what the face of the Virgin Mary looked like, she responded that she could no longer remember the facial features. 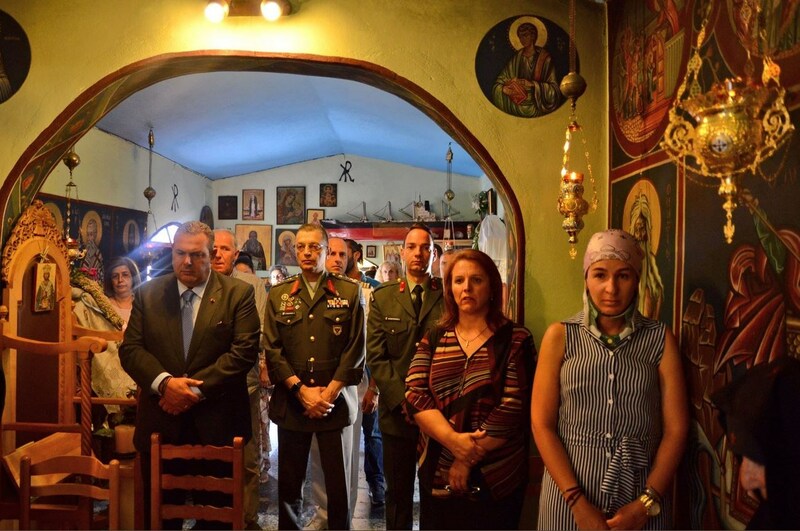 And when asked if the helicopter had any icons, she said that every Greek helicopter has one icon. In the accident, Lieutenant-General Ioannis Tzanidakis, Colonel Thomas Adamou, Major Demosthenes Goulas and Lieutenant Constantine Hatzis died. The helicopter was carrying out a surveillance flight along the northern border to provide a sense of security to the residents of the border areas, a repeat activity periodically.